Core Drill Rental – Core Cut – M-1 Anchor Core Rig, is available for rent in Rochester NY, Ithaca NY and the entire Western New York region from the Duke Company. 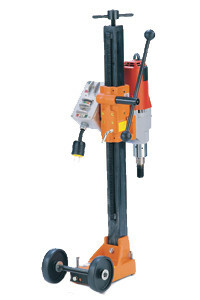 The rental Core Cut M-1 Anchor core rig can be rented, features a 2.5 inch square mast, 6 inch wheels, dual switch control panel, and leveling screws. The slide handle enables drilling in compact areas, and the ceiling jack assists in keeping the drill in place for anchoring or vacuuming the base down.